In a hole in the ground, there lived a Hobbit, and he played all night on his 48k Spectrum. Well, that was back in 1982, when the original version of Tolkienistas’ most preciousss adventure game was launched by Melbourne House. Even the Spectrum elves liked it, and they were notoriously hard to please. The dwarves were not quite so keen, but that’s dwarves for you, they much prefer eating, and singing about gold. So it was that The Hobbit game came, conquered the competition, became the first ever Spectrum game to sell a million (despite never being released in the USA) and passed into legend. But it was always limited by that meagre 48k. Until, in 2015, adventure fans on the World of Spectrum forums had the bright idea of rebuilding the game, with many more graphics, for machines (and emulators) with 128k ram. This exciting but somewhat controversial community project had been ongoing for some time, under the aegis of Speccy dev Einar Saukas, when another dev and fellow member of WoS, known as Kayamon, ‘…got tired of the quibbling over tiny details in the development thread’ and decided to go ahead and finish the project himself, causing fallout on the forum. Saukas stated he was going to finish the game all along, but Kayamon didn’t want to wait any longer, and just did it. Whatever the right of the matter, many users were just glad to have a ‘new’ adventure game to play with, and got on with doing so. Which means one of the oldest and finest Spectrum adventures can also be counted as one of the newest. The game itself plays like the 48k original, but fifty-five ‘new’ faster and more detailed, bit-mapped screens, ported from DOS, C64 and BBC Micro versions of the game, replace the original thirty or so slow, game-drawn vector graphics, adding even more atmosphere, albeit of varying quality. Mick Sparrow also created a much-improved loading screen, and there’s a new title screen crediting the original game authors, Philip Mitchell and Veronika Megler, as well as WoS. The ‘Inglish’ natural language recognition makes for a much better text input parser, which was quite advanced for its time. As you might expect though, this game is no easy ride. There are some tricky puzzles, you probably won’t get through first time. But all the wandering about is made even more atmospheric than before, with the better quality, faster loading graphics – although the colours can be a bit lively. The Hobbit also improved on previous adventure games in terms of artificial intelligence. Some characters ‘move’ about the game independently of the player, so you are never quite sure where or if help is going to come from if you need it. 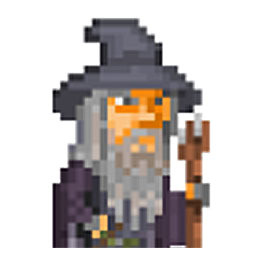 Gandalf, for example, still has a tendency to wander off at crucial moments in the ‘new’ version. It certainly helps to buy yourself a copy of Tolkien’s book, as was supplied with the original game, and which is rarely found with physical copies these days, as it adds much to your involvement in the story. But ignore the films, as they include a lot of material which was not in the book! Both The Hobbit 48k and this newer 128k version especially come highly recommended by this reviewer, who regularly plays the latter version on his Toastrack while wearing a pointy hat. It’s a great game, an ultimate classic, and now looks even prettier. What better way to rekindle your fellowship with Bilbo, Gandalf and co., not to mention good old Thorin, who still loves nothing better than to sit down and sing about gold while waiting for you to get your act together? Original Price: £14.95 Free .tap download. A slightly different version of this review was originally published in the Crash Annual 2018 from Fusion Retro Books, in my Adventure Trail column.